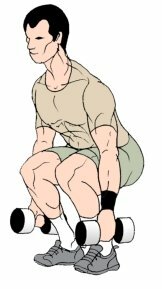 Dumbbell Squats or Dumbbell Front Squats is an excellent alternative to Barbell Squats to build muscle mass in the legs for men and strength for women. Since dumbbell squats allows you to hold the weights on your sides or in front of you, it gives you the leverage needed to do squats properly even if your hip flexibility limits you in barbell version. To Build Muscle Mass or Strength in the Thigh Muscles. Men can train for higher number of sets to Build Muscle and women can go with low sets and high repetitions to get lean. This exercise is done standing with a pair of Dumbbells. 1. Grab hold of a pair of heavy dumbbells and stand upright with feet shoulder feet apart. 2. Bend your knees and lower yourself with your back straight and head up until your thighs are parallel to the ground. 3. Now raise yourself up using only the thigh power keeping your back straight to a position with legs nearly locked out. Warm up well before Heavy Squats. In this version, you hold a hex dumbbell vertically in front of you with both hands and perform the squat. It resembles front squats exercise. Just like the sumo barbell squats, you can hold a hex dumbbell with both hands between your legs and perform sumo squats. In this version you hold two moderate weight dumbbells on either sides, as in regular squats and perform a jump movement instead of just standing up. In this version which calls for greater core stability, you hold two dumbbells in overhead position as in the finish position in shoulder press and perform squats. It requires greater hip flexibility too. You can even do them with just a bar or broomstick till you are confident of doing them in the proper form. These are similar to lunges in the end position but instead of lunging forward you stand with a split. You grab hold of two dumbbells, take s big step forward and stand with one leg in front of the other. From this position bend your legs to squat down and perform squats keeping your core tight throughout the movement. 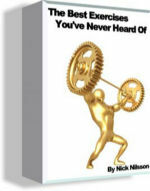 Back to Muscle Building and Weight Training Homepage..